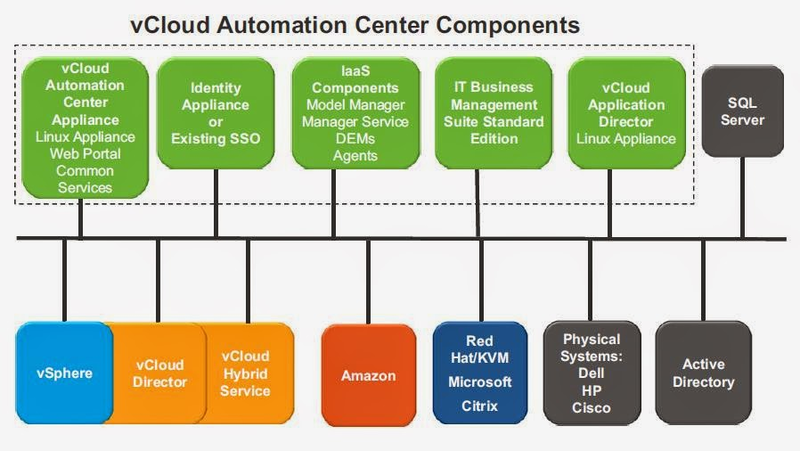 vCloud Automation Center vCAC 6.0 required 3 important components. We should install and configure the below 3 components and its sub components properly to make use of vCAC website to provision and manage the cloud services along with authoring, administration and governance. ITBM and vCloud Application Director are add-on optional components. ITBM(IT Business Management) helps you to examine the financial data of your infrastructure. vCloud Application Director delivers the application services. IaaS Website : provides the infrastructure administration and service authoring capabilities to the vCloud Automation Center console. The Website component communicates with the Model Manager, which provides it with updates from the Distributed Execution Manager (DEM), proxy agents and database. Model Manager : The Model Manager communicates and integrates with external systems and databases. Models included in the Model Manager implement business logic that is executed by a DEM. The ModelManager provides services and utilities for persisting, versioning,securing, and distributing model elements. The Model Manager communicates with a Microsoft SQL Server database, the DEMs, and the console Web site.  Preprocesses workflows, schedules workflows, and monitors DEM Worker instances.  Only one DEM Orchestrator is active at a given time. A standby should be deployed for redundancy. Manager Service : The Manager Service coordinates communication between agents,the IaaS database, Active Directory (or LDAP), and SMTP. The Manager Service communicates with the console Web site through the Model Manager. Virtualization proxy agents are used to collect data from and provision virtual machines on virtualization hosts, for example, a Hyper-V agent,a vSphere agent, or a Xen agent. Integration agents provide vCloud Automation Center integration with virtual desktop systems, for example, an EPI Windows PowerShell agent, or a VDI Windows PowerShell agent.